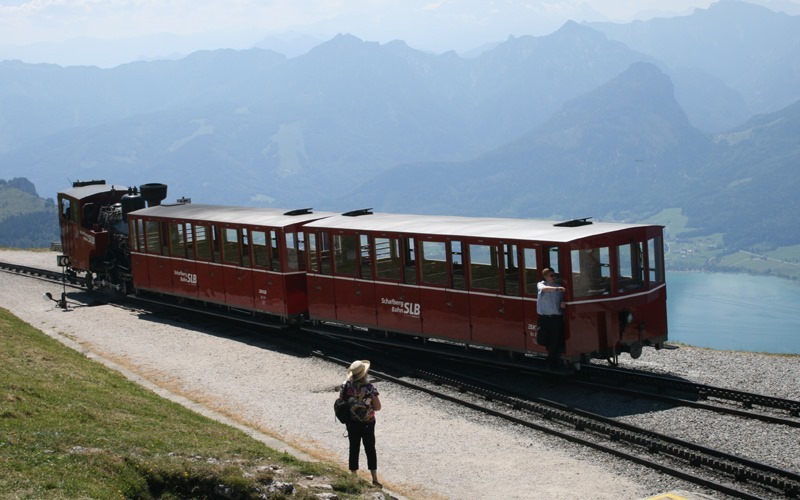 Our plan for today was to go up the Schafberg on the cog railway, the SchafbergBahn. 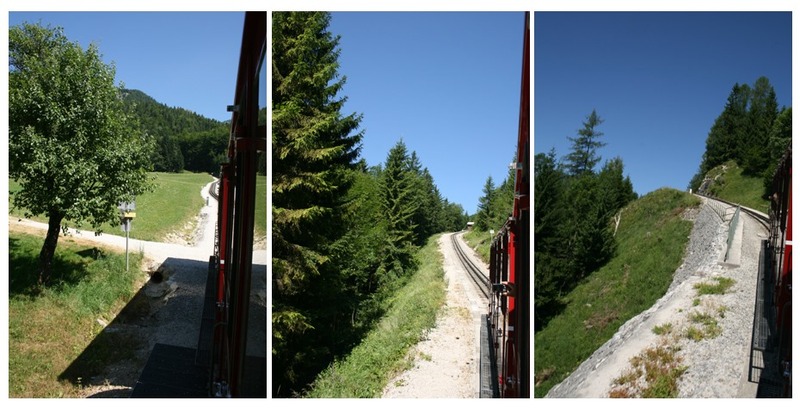 This is the steepest cogwheel railway in Austria and was opened in 1893. 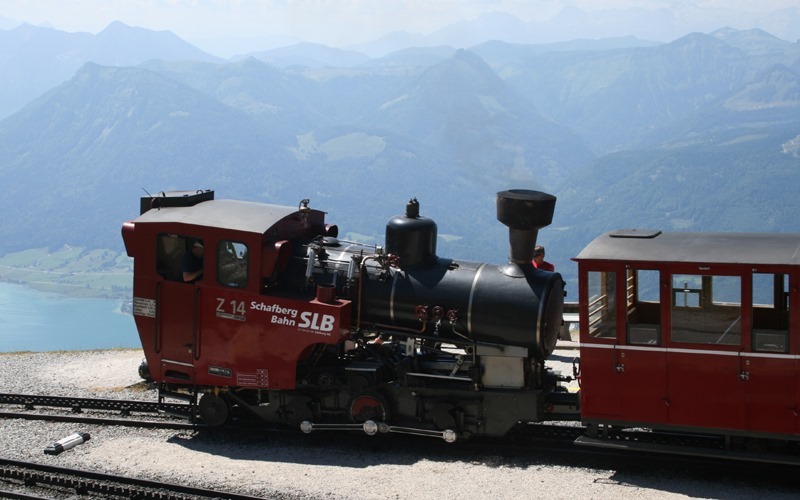 Steam locomotives make their way from the lakeside base station at St Wolfgang to the 1783m high summit of the Schafberg. The journey is 5.85 km and takes about 35 minutes. There are 6 historic coal fired steam locos built in 1893 and 1894. These are supplemented by 4 modern oil-fired steam locomotives built in 1992 and 1995. We purchased a combined ferry and train ticket at St Gilgen which apart from being cheaper had the advantage of not having to queue for tickets at the busy base station at St Wolfgang. A few minutes after leaving the base station at St Wolfgang the track crosses the provincial border between Salzburg and Upper Austria and continues up through fields and forests. 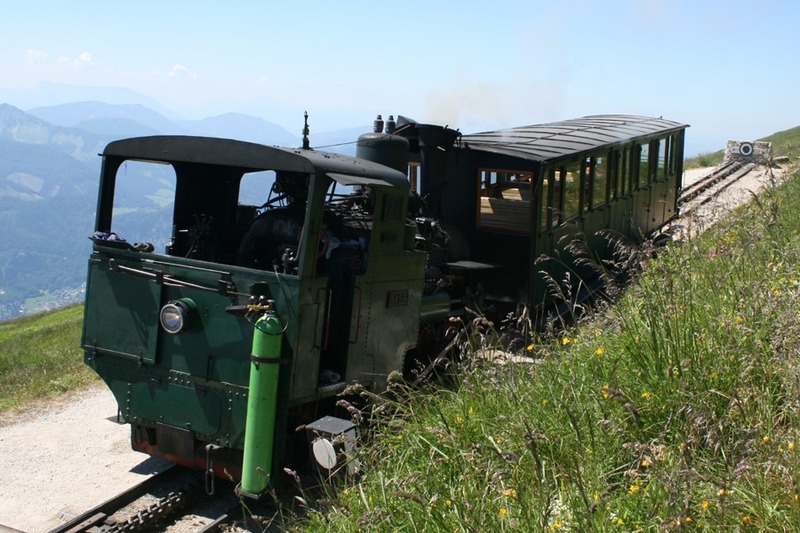 At Dorneralm (1015 m above sea level) we reached the first crossing point where the older steam locomotives used to pause to take on water. The next stop was at 1363m when we reached the small station of Schafbergalpe. 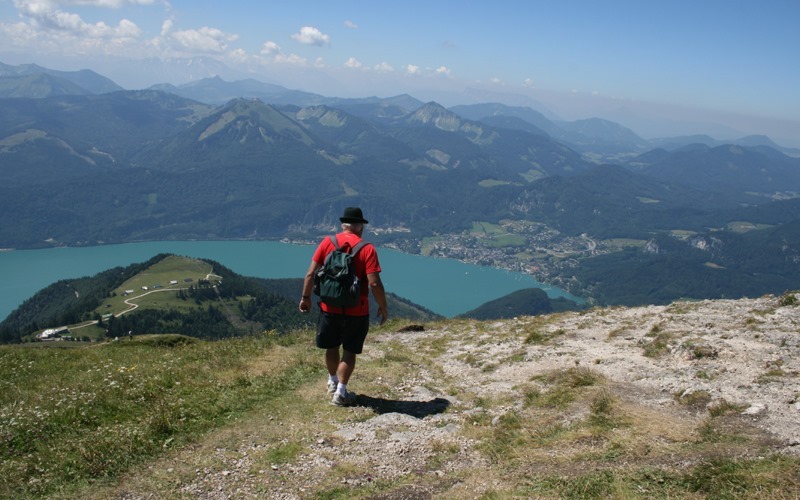 It was then just a further 10 minutes to the summit station at 1783m. 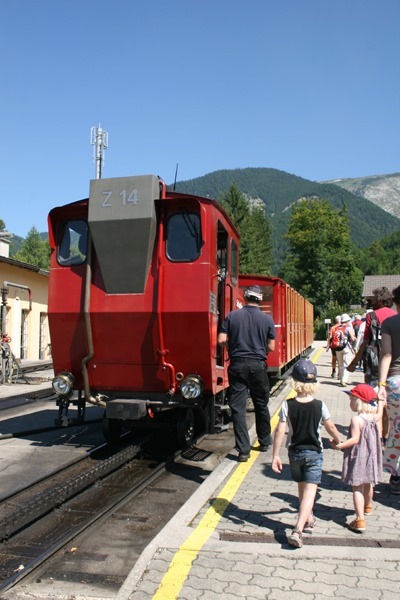 Before leaving the summit station it is essential to book your return seat on the train. We allowed ourselves two and a half hours at the top which was just about right. First I had to take some photos of our train Z14 at the station. Just up from the station is the hotel Schafbergspitze. dating from 1862 it is Austria’s oldest mountain inn, but that could wait. First we had to explore. 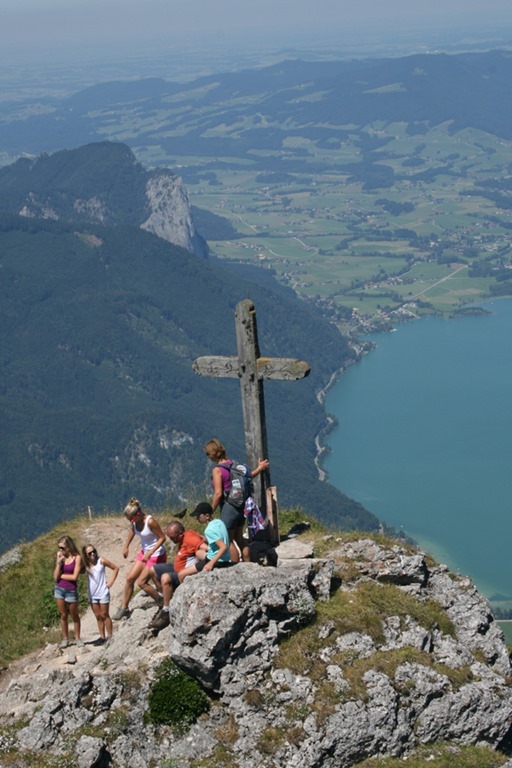 The views were incredible especially looking down to Wolfgangsee. 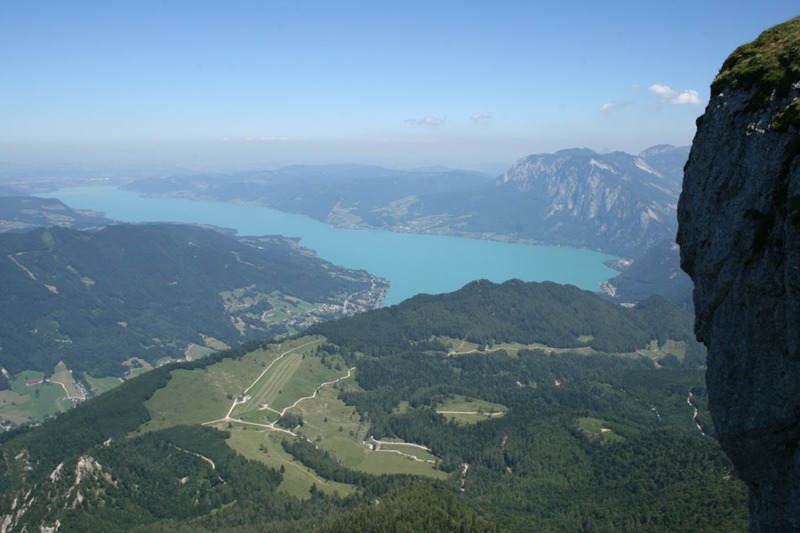 We could see the whole length of the lake from St Gilgen to Strobl and I have stitched three images together to form a panorama. We walked on a firm but rocky path admiring the view but then I saw a little peak with a cross on top. I had to go there but it was not as easy as I thought. First I had to drop down to a lower path and I had to be careful as I was not wearing my boots, just trainers. As I rounded the corner the viewpoint changed, it was getting harder. I scrambled up to the top and stood there clinging tightly to the cross. It was not a moment of religious fervour. It was fear. I suddenly realised how exposes it was with a sheer drop on three sides. 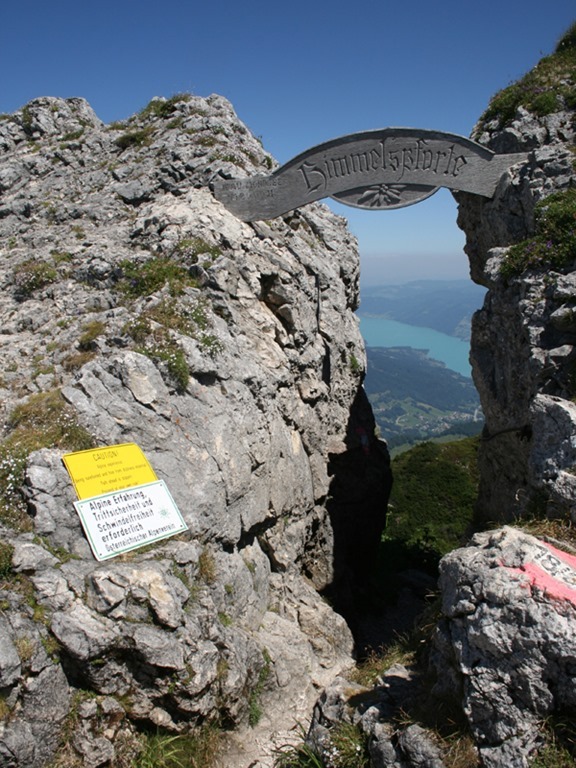 On the way back I passed a cleft in the rock and a signpost indicating a way down to Attersee. I could see fixed ropes and a warning sign that read. Caution. Alpine experience. Being surefooted and free from dizziness essential. Path ahead is slippery. Proceed at your own risk. Not the way for me. When I re-joined Jean I was out of breath. Was it the altitude or just relief? We ate our picnic lunch and then slowly made our way up towards the hotel. The meadows alongside the path were full of wild flowers and I could not resist taking lots more photos. Jean acted as spotter whilst I crawled along on my hands and knees. We headed for the bar at the Schutzhaus Zur Himmelspforte for a relaxing pint. It was soon time to catch our return train but first I climbed up onto a path alongside the bar which led to another hut. 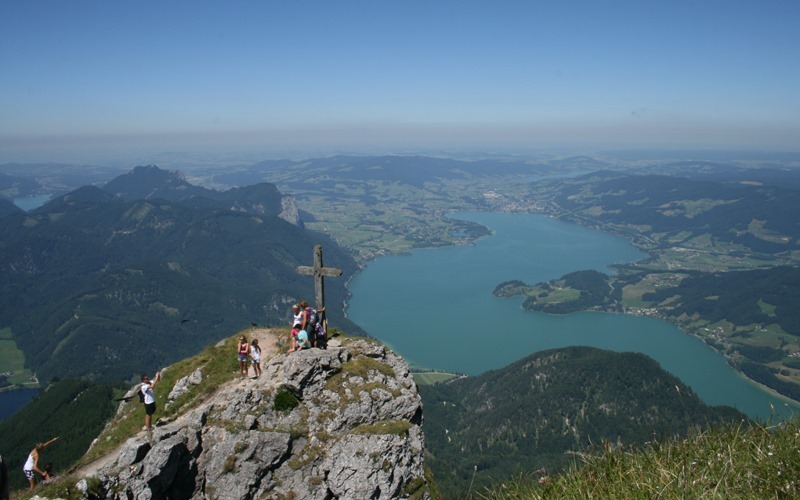 From the path there were marvellous views looking down on Attersee and Mondsee. An incredible panorama. Back at the summit station I was delighted to find that one of the old coal fired steam locos was there. Once again I was dashing around trying to get a photo, but it was not easy. Lots of other people had the same idea. I could here our train approaching this time it was Z11. The journey down was slightly quicker and we had just a short wait before catching the ferry back to St Gilgen. It had been a superb day. 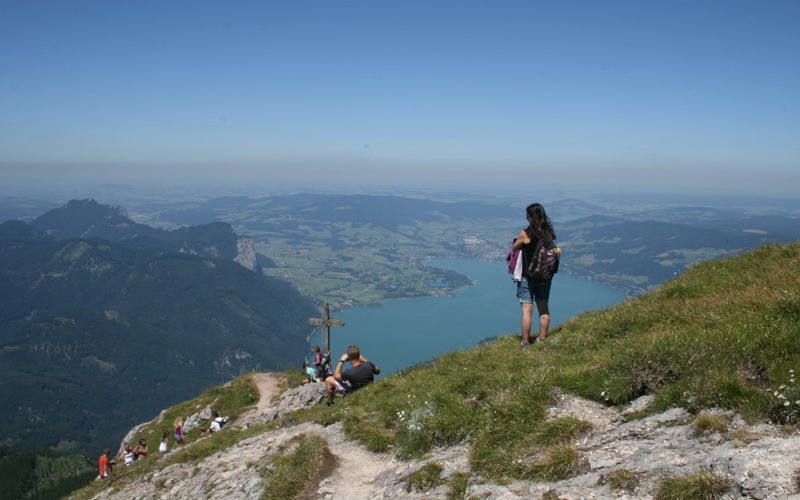 When I booked this holiday I had thought about climbing the Schafberg from St Gilgen by following the E4 European long Distance Hiking trail from Winkle. However it would not have been sensible to have attempted it on my own. In any case it was too hot. 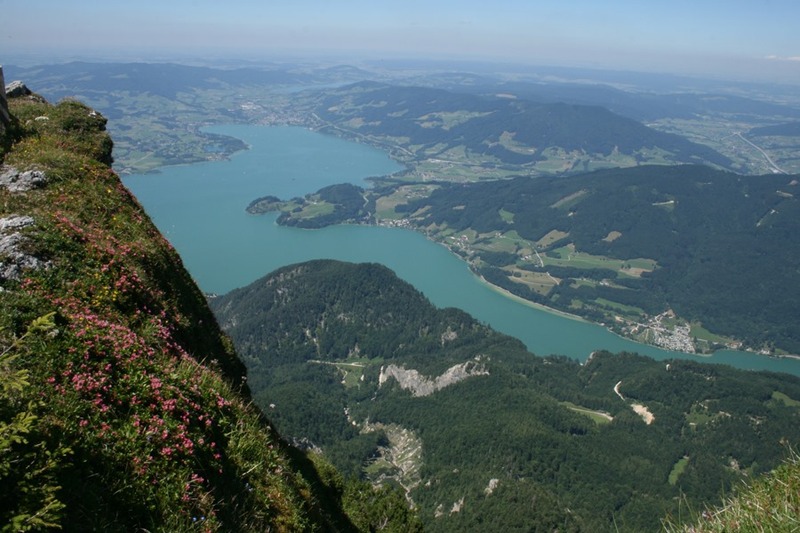 This entry was posted in Austria, Natural History, Photography, Salzkammergut, Travel, Wild Flowers. Bookmark the permalink. Great photos. 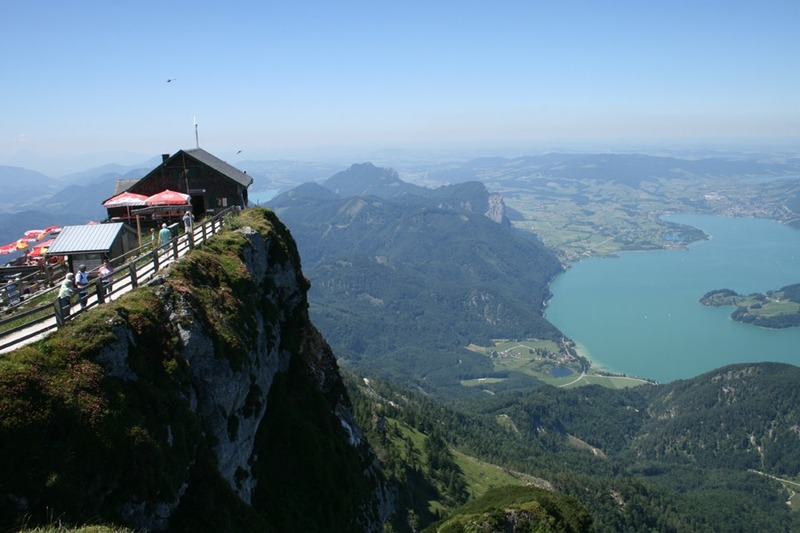 The views from atop the Schafberg are one of the best ever, in my opinion. 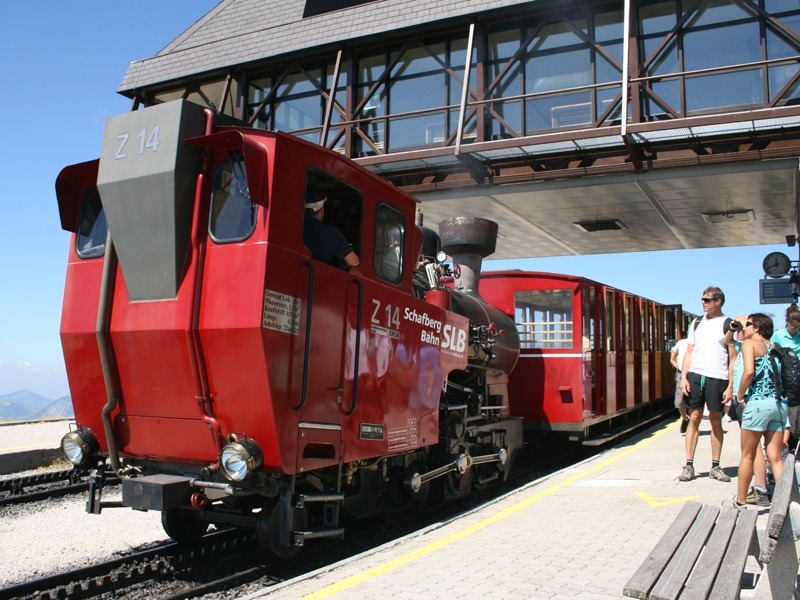 I enjoyed reading about your day out on the Schafberg Mountain Railway. Superb photos, they brought back happy memories. Thank you crosbyman66 ! Likewise, and your beer must have tasted good on that hot day. It did for me . Cheers ! Thanks Rahul. 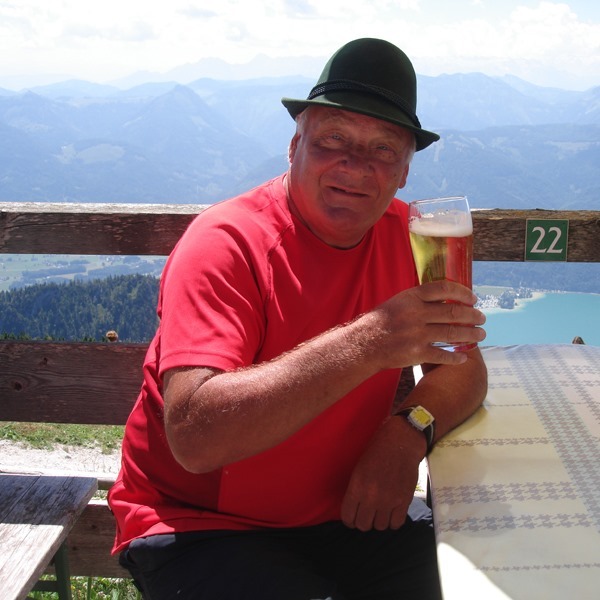 I will be back in St Wolfgang in July. Looking forward to more beer and maybe some apple strudel.